We seldom think of tyres as being as important as the engine or the brakes, perhaps. But if you don't take care of your tyres, your bike's handling, performance and fuel efficiency will be severely affected. We at MRF Tyres know this, which is why we have created a one-stop solution for all your tyre needs. The MRF T&S combines all the technological know-how and experience we have gathered over the years, along with highly-trained service personnel to make sure you go that extra mile. Because you deserve the best. Let's talk shoes. Does one size fit all? Can rexine sneakers be used for trekking? Or can suede leather be used for working out? No. The same goes for tyres. 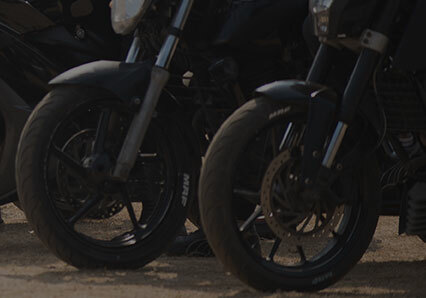 While selecting the best tyre for your bike, one must take into account what is expected of a new set of wheels while off-road tyres are good if you stay in an area where road quality is bad, symmetrically treaded tyres are preferable for urban areas with superior roads. Nylon is a strong, yet light textile. It is used in a variety of fields, from clothes to body armour. Tyres also contain nylon, along with steel and other materials, to help improve strength and stiffness. 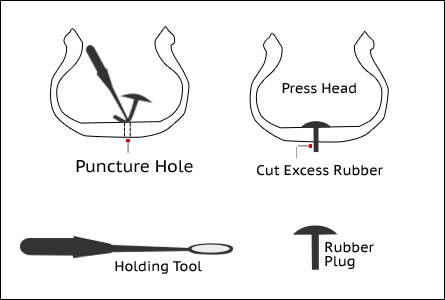 A single unit of rubber, the most basic building block of rubber, is called a cord. When the cords are arranged in a criss-cross pattern, like in a knit sweater, it is called a bias ply construction. When the cords are arranged in a tangential pattern, like in the strings of a guitar, it is a radial pattern. Radial tyres are the industry standard when it comes to automotive tyres in India. Ever heard your shoes squeak while walking on a wooden floor? That is the sound of your sole creating friction, helping you to walk. This happens because rubber, when in contact with a surface, offers resistance. This resistance is also loosely called “grip”. Grip depends on many factors like composition of the surface, the area of contact, the weight applied, and so on. This concept can also be applied to tyres. The parallel or v-shaped grooves on the outer surface of a tyre are called treads. Tread design plays a crucial role in comfort, handling and braking. 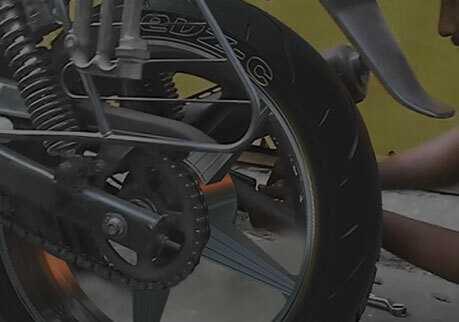 The tread design of a tyre plays an important role in handling and ride comfort. 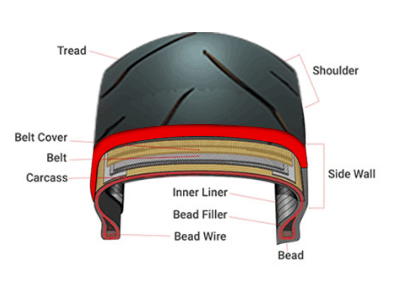 Tyres which do not have any tread (slick tyres) are used in racing because they offer maximum contact area, but are best-suited for race tracks, and not for ordinary use. Straight-cut tyres, or tyres with straight tread are best suited for heavy load and long haul applications. 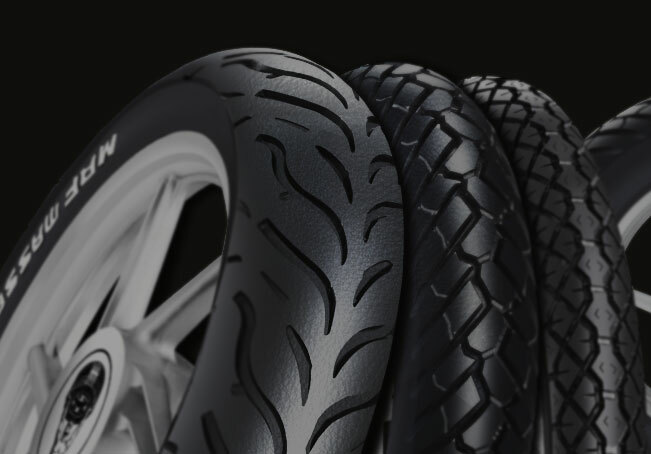 V-tread tyres offer the best grip in most everyday situations, along with good wet grip. The best tyres feature a combination of different type of treads to improve grip on all sorts of surfaces and make it more versatile. We have all kicked a ball around once in a while. And we all know that what keeps a ball round is the bladder, a thick rubber balloon that is inflated with air. Most modern football now a days don't have a bladder, which helps in reducing weight and improving swing. Tyre tubes are very similar to football bladders. Tubed tyres are cheap and easy to maintain, suffer blowouts, which can cause accidents. 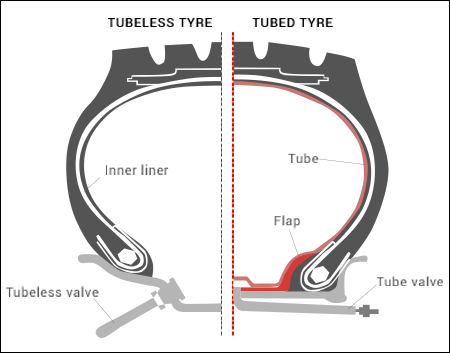 Tubeless tyres do not have a tube, but have a reinforced sidewall. They are lighter, and hence more fuel efficient. While checking out from a store, the attendant scans your purchases with a barcode scanner. The barcode contains black and white lines that contain all the information pertaining to the product. 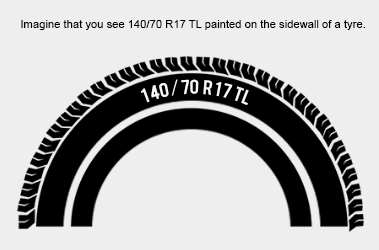 Similarly, every tyre has a set of markings on the outer wall, which can tell you everything you need to know about the tyre. 140 is the section width (140 mm). 70 ,is the aspect ratio , which is the ratio of the sidewall height to the width(70%). R indicates that the tyre is of a radial construction. In case you have a doubt, consult an MRF T&S for help. So you wake up one day and decide that your bathroom is too small, your living room cannot accommodate that 51 inch TV that you were dreaming of buying and the parking lot can only house one of your three cars. What do you do? Go in for a larger house, obviously. But when it comes to tyres, bigger is not necessarily better. When going in for larger tyres, you “upsize”, or upgrade. These are things you need to keep in mind while upsizing. Upsizing involves fitting larger tyres, which may or may not require a rim change. While upsizing, the overall outer diameter must remain the same. 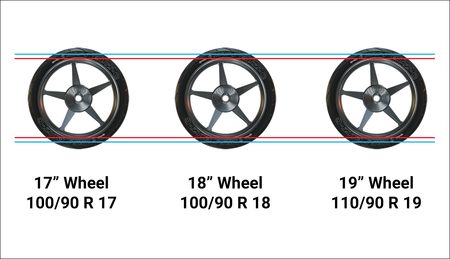 The aspect ratio of a tyre is inversely proportional to the wheel diameter, which is also an important factor to be considered. This is because choosing a tyre of incorrect dimensions can affect handling, fuel efficiency, ABS operation and cause degrade ride. Always stay within 3 percent of the stock tyre specifications (rolling radius and circumference) to be on the safe side. A tyre is like a football. Just like an over or under inflated football can spoil a game, an improperly inflated tyre can cause a lot of problems. While an overinflated tyre can result in a hard, bouncy ride, an underinflated tyre can damage handling and steering quality. 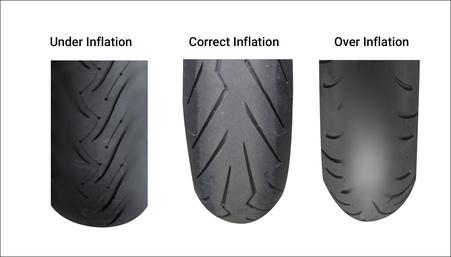 Always keep in mind the proper inflation pressure for your tyre. Pressures differ depending on the weather, the size of the tyre and the amount of load to be carried by a vehicle. As a rule, it is better to overinflate tyres rather than underinflate them before setting off for that drive you have been dreaming of for a long time. Every tyre has a Tread Wear Indicator, which looks like an upward-pointing arrow. If the outer wall of a tyre touches the tip of the indicator, it must be replaced. Tyres must have a minimum of 2mm tread depth left, to be effective. In many places across India, the roads are not properly laid out. Bad news for tyres? Yes! Absolutely. Broken pieces of tarmac, debris from road accidents, rusted bits of construction material litter our roads everywhere. Add to this potholes and you have a destructive mix leading to tyre punctures. So what do you do when you suffer a flat tyre? Keep in mind these points. As far as possible, fixing punctures without trained assistance is not recommended. In case there is a puncture, park your bike on the centre stand, and turn on the indicators. Check where the puncture has occurred. Loosen the wheel lugs first, then remove them. Just like you like wearing cool shades, wearing a cool jacket and having that cool hair-do, there is a way to make your tyres cool as well? How? Nitrogen. Yes the same gas that makes up 78% of air. 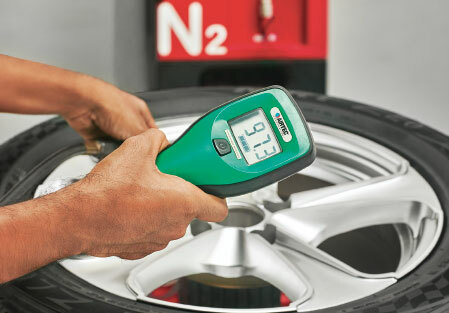 Nitrogen is an inert gas, so it does not expand as much as air when your tyres get heated up. Not only that, Nitrogen does not contain any water molecules, which protects the rim in the long run. Since the gas molecules are larger, tyre pressure is maintained over a longer period of time compared to air. In case you didn’t know, Nitrogen is used to inflate tyres used for fighter jets and race cars. Think about it. Inflating your tyres with Nitrogen prevents sudden blowouts. Nitrogen molecules are larger, meaning that it cannot escape from microscopic pores in the tyre, whereas air can. This means that Nitrogen‑inflated tyres lose less pressure than air over the same period of time. Nitrogen is lighter than air, which leads to fuel savings. Every MRF T&S is equipped with a state‑of‑the‑art nitrogen generator which ensures that only 95.5% pure nitrogen is used for your tyres. Look out for obstacles while driving, avoid breaking suddenly. Inflate your tyres to the recommended pressure. Always inflate your tyres to 2 PSI above the normal pressure when planning for a long ride. Check and replace worn out or dirty valve caps from time to time. 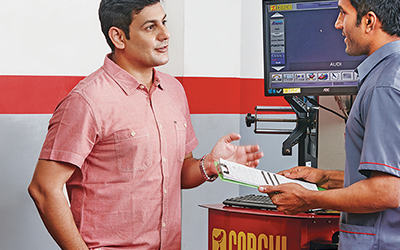 Consult MRF personnel before going in for an upsize.